To take advantage of our exclusive bonus, simply open an account on interactiveoption.com by clicking on the link above. Our bonus offer will be automatically acquired. The platform through which customers can trade on Interactive Option is dynamic, yet user friendly, fresh looking, intuitive and…interactive! Besides those wishing to trade via their computer, Interactive Option caters for the needs of those customers who want to trade through their smartphones or tablets via Android or iOs, using its specially designed mobile trading platform, allowing them to trade on the go, wherever and whenever provided they can have access to the internet. However, what makes trading binary options via Interactive Option even more versatile and appealing is the fact that it offers its traders a selection of unique trade types. Alongside the Basic Up/Down trade option, it also offers Long Term, 60 Seconds, One Touch, Ladder, Forex and Pairs trade options. This wide variety enabled this broker to appeal to a range of different traders, both novice and seasoned professionals, who have different trading styles and requirements. The Interactive Options’ clients are not spoiled for choice only when it comes to the trading methods they have to choose from, which of course carry different risk levels and can lead to different payout levels, sometimes reaching an impressive 500%!. They are also very well served when it comes to the tradable assets menu offered by the broker, which includes a wide selection of assets from all major asset categories, currency pairs, stocks, indices and commodities, which total more than 100 assets to choose from. Moreover, all the assets and trading types can be combined with a very wide selection of expiry times, which means that trading binary options through Interactive Options is truly versatile and can be tailor made to the needs and requirements of each trader. Interactive Option offers its customers the possibility to choose between 4 different account types each coming with its own unique features and perks depending on the amount they are willing to commit in their first deposit. The Blue account is those with initial deposits between $250 and $1000 and it also grants its holders with their first two trades being risk free as a welcome bonus, as well as providing them with platform training on how to trade binary options. The next account type is the Silver account, offered to clients depositing between $1000 and $4500 as their initial deposit amount. The welcome offer for such account holders is 2 trades up to $100, while they are also entitled to receive weekly financial analysis and 1 training signal per day via email, while also having access to weekly promotions. Gold account holders are expected to deposit between $4500 and $10000, but in return they get 2 trades up to $300 as a welcome bonus as well as financial analysis twice a week and 3 trading signals per day via email. Moreover, they are entitled to free access to 5 training webinars and they can receive advanced online training, assistance from a dedicated personal advisor and access to weekly and personal promotions. The crème de la crème of account types is the Platinum account, the holders of which need to initially deposit between $10000 and $50000. 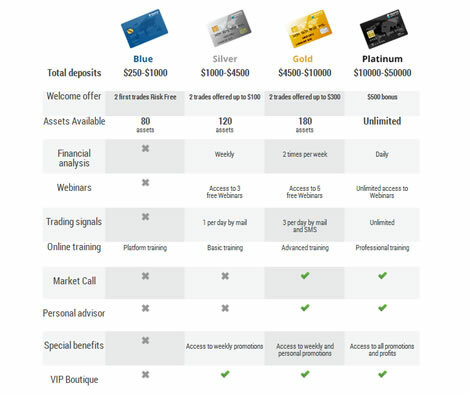 As a welcome offer they get a $500 bonus and they enjoy all the benefits of the gold account, with the difference being that they receive daily financial analysis data, unlimited trading signals, unlimited access to webinars, professional online trading and access to all promotions. The people at Interactive Options have compiled an impressive array of training and educational tools for the benefit of their clients in order to assist them in placing successful binary options trades, although the access to such tolls and services is determined by the kind of account type that a client holds. Such tools include webinars, an e-book, video tutorials, live trading events, trading strategies, trading signals, market reviews, news and analysis, a software walkthrough and even one-on one personalized training programs. 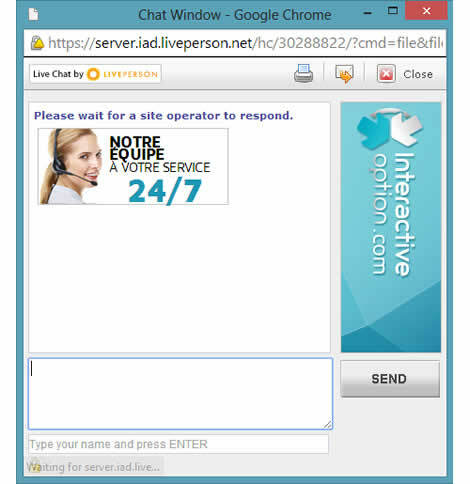 All clients can also expect to receive prompt, reliable and friendly customer support, which is multilingual since the site is available in English, French, German, Russian, Spanish, Arabic and Portuguese. Moreover, the customer support agents can be reached via email, live chat or through calling one of the local phone numbers, which are available in the UK, France, Cyprus, Russia, Canada, South Africa and Saudi Arabia. 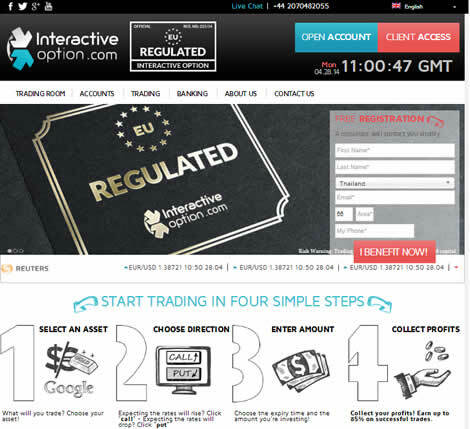 Its dynamism, innovation, generous bonuses and promotions policy, the simple deposit and withdrawal procedures, variety of educational and training tools and dedicated customer support, coupled with the fact that it is an EU regulated broker that allows traders to trade within a safe, reliable and secure environment, has meant the Interactive Option has gained popularity amongst EU based binary options traders and that it can aspire to an even brighter future ahead. I used Interactive option broker & their withdrawal procedures were scandalous with no possibility of on line chat or response to withdrawal request by email & only answering machines on the phone. It took 2 months of withdrawal requests on their site and endless non answered emails to all of their departments. There representative tried to take money out of my credit card without my permission as my bank intervened. They should be at the bottom of your list. Very unscrupulous. It’s strange, I trade on this platform for almost a year and I have never encountered this kind of problem. Are you sure you didn’t get the wrong number. Do you already have an interlocutor from Interactive Option before? You should contact Lena from the support, she will certainly help. I always call her when I have a concern. Being too busy during working days, I can trade only during the weekend and it was quite tough trying to find open platforms. Then a read about Interactive Option in a forum and found out it is possible to trade on Saturdays and Sundays. I tried the “”One Touch”” option with predetermined rates, meaning that as soon as it is reached or exceeded on the closing date, it’s a profit. That’s what I experienced: the € 500 invested on Saturday amounted € 875 the next Monday, i.e. 75% net profit! I trade binary options for several years now, and I can say that it really pays, although I still need to work and can’t live on it. I made my debut with Interactive Option and I took every time advantage of its ebooks and videos. It is through these materials that I learned the tricks of trading. I heard about binary options some years ago. I have long believed that it was just a scam, thinking that it was impossible to make money so easily. A few weeks ago, I met an old friend, I was surprised to learn that he wins money with binary options. This friend trade on Interactive Option. I think that I’m also going to invest. I checked, Interactive Option is regulated by CySEC, it’s reassuring. Hello there, I’m new to Interactive Option. I trade binary options in recent weeks. I asked for a first withdrawal three days ago and I still haven’t received the money. I wonder how long it takes to receive the money? Hello, wait a little, it will surely come. For the delay issue, it depends on the payment method you requested. In general, for a bank transfer, it can take five days or more. Well, I’d like to know from how much is it possible to withdraw money on Interactive Option and how long it will take to receive the money? I trade binary options with this broker for three months and I almost doubled my capital. To my knowledge, you can withdraw your winnings as you want with no minimum or maximum required. For my part, I always get the money within five days after the withdrawal request. It does not take too much time. Hi, I’m new to Interactive Option. Can you guys tell me what techniques I have to learn first. There are so many. Hello, try to contact its customer service, you can seek advice from them. They are wonderful and in addition they are always available. Every time that you have a problem, you can ask them by phone or Skype. Hello, I am on Interactive Option since the day before yesterday and I started to train myself in the techniques of trading binary options. The guides of this broker are really good and easy to understand. I’ll start investing shortly. Do you have other tips? Hi, I advise you not to rush. Take the time to understand all the techniques. Don’t hesitate also to contact their customer service if you are worried, they are really great and can give you good advices. Hello, I found no broker that isn’t qualified as a scammer on forums. Hi, it’s true that there are a lot of scams in this area, but do not exaggerate, there are also good ones. I advise you Interactive Option. I trade with this broker for a few months and I’ve never had a problem. I won a lot of money and I have never had a problem with withdrawals. I’ve been trading with Interactive Option for the past few months and it’s been going great. Made a nice amount of money and got my withdraws on time, more than you can say about other binary brokers. I can fully recommend them to any beginner. Interactive Option has been a great broker to me so far. Earned 600$ this last month alone! Can recommend them to anyone who’s just starting out..
Had a pretty good experience trading with Interactive Option. True, they don’t always deliver withdrawals on time and their salesmen are quite pushy but all in all, other binary brokers don’t hold a candle to their professionalism. 2 – Trade 43k USD volume on my account in 6 minutes!! and lost the entire 14K balance!!! 3 – Did 2 withdrawals from my credit cards for a total of 4.5 K USD. They are no longer contactable and CYSEC are very unresponsive. My real point is that people (like this website) who endorse companies like Interactive options should stay up to date with developments – Why are they not on the blacklist! !